A few weeks ago I went to Winfield Kansas to compete in the National Hammered Dulcimer Championships. This was my 4th time competing in the national championships, and while I've done well in regional contests, the national contest has been a challenge. In the past 4 years, I've really developed an understanding of the effect that competing on the dulcimer has on me. I am more than happy to share my personal ideas on competition strategy to anyone who might be interested. I've competed 6 times, won three and bombed a few as well. I think, for me, the experience of NOT doing well taught me more than the thrill of actually winning. I'm not a one to repeat the same thing twice, so if you are interested in getting advice on what strategies worked and what didn't, I'm happy to share my own personal musings on the topic. Just hit me up on my contact page. This year, I was torn on attending Walnut Valley Festival. I had a big presentation in Chicago at 7 on September 19. The National Hammered Dulcimer Competition is held in Kansas on September 21. This gave me one day to get there and get settled and one day to "enjoy" the festival....or compete. I knew it would be one or the other, and I knew if I didn't compete, I'd wish I had. Unlike any contest previously, I only committed to attending about 2 weeks in advance. I ran through some "contest worthy" material and recorded it onto my phone. When I listened back I thought, "This sounds pretty good. I guess I'll go!" I didn't want to go alone. I'd brought my mom the year before and she was completely unimpressed with the whole thing. I didn't want to do that to her again, but she's a trooper and agreed to accompany me on the road trip beginning at 9:00 Thursday night. I was in downtown Chicago preparing for my class presentation when I made a pit-stop at the ladies room. The doubt was already taking over me. I recall looking in the mirror and thinking, "You're not going to win...and that's ok. It's just not in the cards. So what?". I swung by my house afterwards and picked up my mom. Then we started out on our trek. It was pouring rain and I was getting really sleepy, so we stopped for the night in Iowa City and drove the rest of the way the next day. Fortunately I was driving, so I wasn't really on the social media grid. We stopped for lunch in Flint Hills and I made a grave mistake. I looked at Facebook on my phone, at which point it became clear to me exactly who I was going to be competing against the next day. Commence anxiety. Anxiety is a problem for me on a daily basis, but performance anxiety (aka: stage fright) has been know to completely disable me in situations of high pressure. As the day progressed, the feelings of doom intensified. I couldn't eat and I felt queazy. We got into Winfield and decided to check out the festival. I immediately saw a few familiar faces and just became horrified with the prospect of competing the next day. I think we were there about 15 minutes before I started feeling really terrible...so we left. When we returned to our B&B, I decided to unpack my instrument and run through my tunes. Here's where this moment differed from any competition I've ever been in. Sometimes I get to feeling confident when I'm away from my instrument. Then I get to my instrument and I can just feel things going wrong. This time, I felt overwhelmed with doubt, but when I sat down and played, everything felt right again. That's when I decided I was absolutely going to compete. I knew what I was up against, and I knew it was a long shot, but everything felt ok. I didn't sleep much. I still felt doomed the next morning...but it wasn't unbearable. The people at my Bed and Breakfast are some of the best people in the world and they were so supportive. They've seen me through a couple rough weekends these past few years, so it felt like a big family. I practiced on the porch of the barn for a while that morning, then very meticulously fine-tuned my dulcimer and put it in it's case. Boy was I glad I did! One thing I've learned is that it is nearly impossible to do a good job of tuning your instrument on the grounds at Walnut Valley Fest. Once at the festival, mom and I watched the end of the Flatpicking championships and the winners speech put me at ease. I signed up at the last minute, and didn't rush at all to get back into the contestants area. I didn't want to see, hear, or chat with anyone back there. They're all lovely people, but I didn't want to wig myself out. So, I just hung out on a bench and read a little book I picked up called "Keep Calm for Ladies". Best. Book. Ever. At least it was for that day. When the time came to draw numbers, I drew a 7, which was perfect. Not too early, not too late. I had just enough time to get my instrument out, resist the temptation to tune it, chat with some friends I hadn't seen in a while, and finish my iced coffee. In round 1 I played Red Wing and Mona Lisa. I was happy with how I'd played and I didn't hear anyone else, but in my experience, those things don't matter. Nothing is what it feels like when you are competing. The moment when they read the 5 finalists, I felt defeated...it was like deja-vu. I'd been there before and I kept thinking, "It's going to happen again...and I'm going to have to be OK with that." But it didn't happen. I made it into the final round. By this point, I was surprisingly cool with the whole thing. I figured getting to the finalist round was something I'd only accomplished once before and I was feeling relieved that I'd get to play the tunes I'd prepared. There isn't a whole lot of time between rounds, so I quickly ran through them in the contestants area and then headed backstage. My performance felt solid. I was able to hear the other contestants in the second round. It's tough to judge how other people sound when you are competing against them,but everyone sounded pretty impressive to me! The judges didn't take long to reach their conclusions. I always remember it taking longer. They corralled the top 5 into the little room that I'd only been in once before. This is a small room where they let the contestants know the results before announcing to the audience. They started by announcing the 2 finalists. I was prepared to get a plaque. But I didn't. Suddenly I was regretting not putting more effort into my appearance that day. I was in shock when they announced the 4th place finalists...and then they announced 3rd place. I didn't hear my name. I knew I'd placed at least 2nd. and that was tough to compute. They skipped over announcing 2nd place and went straight to the winner. Hearing the lady say my name was one of the weirdest sensations. It seems lame to say that now, but I remember having that weird blackened vision I only got as a kid when I'd hang upside down on a swing for too long. I had nothing prepared to play. I felt completely stupid. I think when I got on the stage I said something along the lines of "I'm just glad I will never do this again. "...and then I butchered a hymn in typical "Katie Moritz" fashion. I felt guilty. As much as I wanted to win, my experiences in years past had made me feel unworthy in comparison to the other people I was competing against. I don't feel guilty anymore. I don't know how I feel...I guess the most honest thing I can say is exactly what I said then. I'm glad to be done competing. I met a lot of great friends through the process of competing, and I feel proud to have been in the competition circuit with some seriously tough competitors. The experiences inspired me to learn so much about my instrument and about myself. But I am glad to be past it. I did the whole "Carp Camp" thing afterwards and that was lots of fun. Facebook announced the winners before I had a chance to contact anyone, so my husband found out. He then contacted Bill Robinson's daughter who contacted Bill. I had not even told Bill that I was going. He's been my mentor since the beginning and I wanted to either surprise him with good news, or sweep the whole thing under the rug. I was just going to wait till I went to his house Tuesday, but my phone started blowing up with notifications, so I knew I had to call him first. When we got back the the B&B I was greeted with a message from the owners that we'd have a celebration the next morning. That was really cool. The people there are the biggest reason I keep returning to Kansas. I've received my new dulcimer, which is an extended range Russell Cook Edition. It's a beautiful instrument with a LOT of notes to get used to. Right now it has that "newborn" dulcimer twangy-ness, but the Masterworks tone is still clear. I'm sure it'll come around with some quality time. 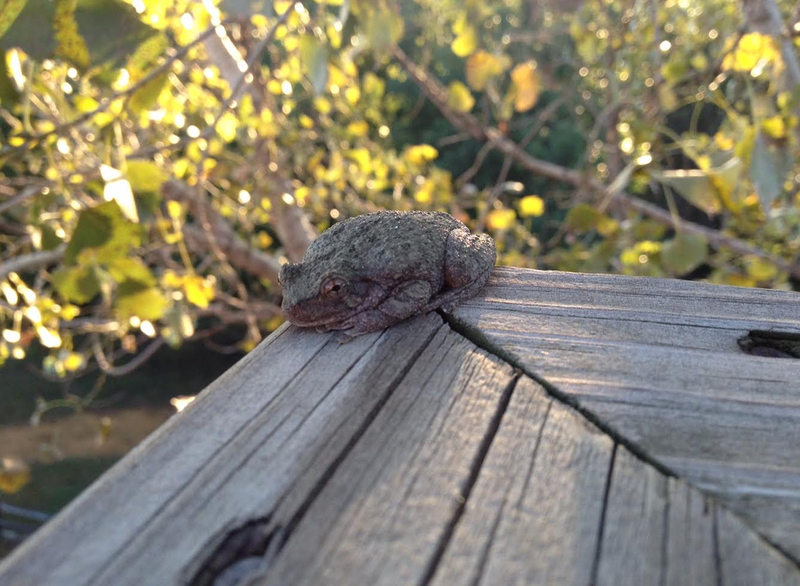 I was greeted on the balcony by this toad. The Bed and Breakfast family. Have I mentioned how awesome these people are?